Spring Break in this household just kicked the bucket. Kaput. Gone in a flash, just like that. Entrance to the Huntington Library, Art Collection & Botanical Gardens--an amazing place to visit. Well, friends, it was a whirlwind week. Not enough time is my usual mantra, and I mean it now, more than ever. Sunrise, sunset. And, of all the things we did together this week—two movies, tea with friends at the Huntington Library in San Marino, shopping, lunching at our favorite cafe, etc.—the most glorious of our experiences is captured in the photographs below. We floated, we too, mother and daughter, in fields of spectacular color. 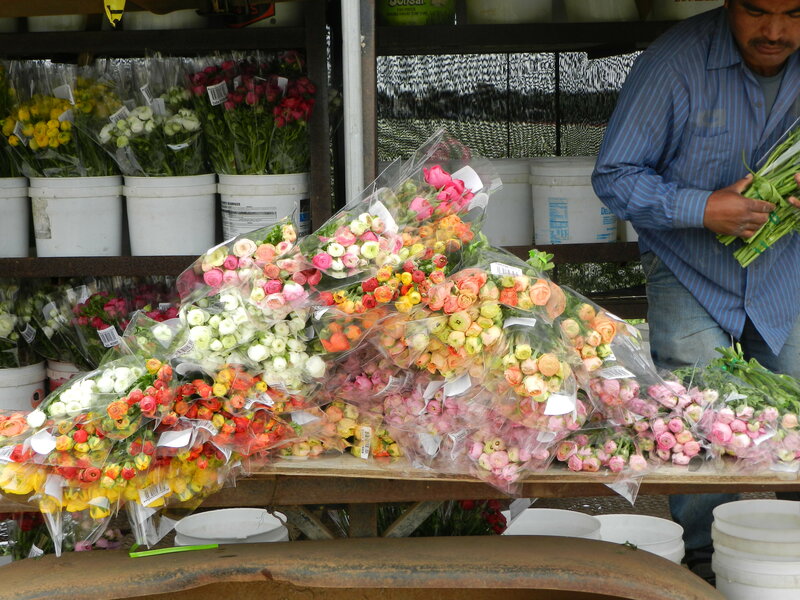 For the ranunculus are in bloom! Row upon row of reds, yellows, whites, pinks and oranges–as far as the eye can see. A world of enchantment, like a bouquet of Technicolor extravaganza that has been sprinkled with golden fairy dust. Way too beautiful for mere words. And fleeting, too, for in four weeks this will all be gone. Sunrise, sunset. There was me, excitedly running ahead with my camera, taking over 100 shots from every possible angle. And there was my girl, my chica who recently turned 21, following close behind with all the patience in the world. She has it all and I have none, my New York spirit still strong, while hers is firmly planted in laid-back California. Different, yet the same. Blinding brilliance; heaven on earth. It’ll be months before I see my daughter again, but I’m already looking forward to it! That’s wonderful! I may be going back myself, this time with a friend. Be sure to take your camera! Everything beautiful comes from California. I fell in love with the state 10 years ago and it’s been my ongoing commitment to move there, so I can see these flowers every day! Once I got over the idea of rattlesnakes and coyotes, wildfires and flooding, I fell in love with it, too. 😉 But yes, it does have its beauty–and generally gorgeous weather. Lisa, thank you for your kind words. I’m glad you love the song as much as I do. Funny, but we don’t value its true meaning until we have children of our own, and daughters, indeed, are very special to their mothers. 😉 So pleased you like my photos, too. Thanks! Beautiful post, beautiful photos! I love the song Sunrise Sunset. When I was a child, it used to make my mother cry and it does the same for me today when I look at my own daughter. I love your description of the way you cherish time with your daughter, your girl, now a woman. Mine turned eleven last week. The years fly! What gorgeous photos, Monica! So, you finally got some Spring there, too? I’m glad you did, and I’m double-glad you got to enjoy it with your daughter! Funny how, when they’re little, we tend to view them as extensions of ourselves, but, when they become “of age,” we see how they’re “their own persons.” That’s a good thing — no?! You love you kids, so much. What a great Mama! Big hug! Thanks, Jodi, I really do! Beautiful flowers Monica nd a very lovely post. The lyrics to “Sunrise, Sunset” were well chosen. So much captured here . . . seedlings and flowers, mothers and daughters. . . all of which speak to cycles of life, spring as renewal. The photos are exquisite and make just want to run through them, with complete abandon. Oh, glorious spring! The joy of spring is captured in these flowers. It was bliss to be among them. Even more special, I was there with my daughter. Yes, oh glorious spring!! Beautiful photos, Monica. Those flowers look like a dream; something in the movies made brilliant by colors and light. But it’s really nature in perfection. So beautiful…Thanks for sharing. Totsy, I’m thrilled and can’t wait to see the results! Cherished moments w/ your dear daughter…. & the blooming flowers seem so apt. 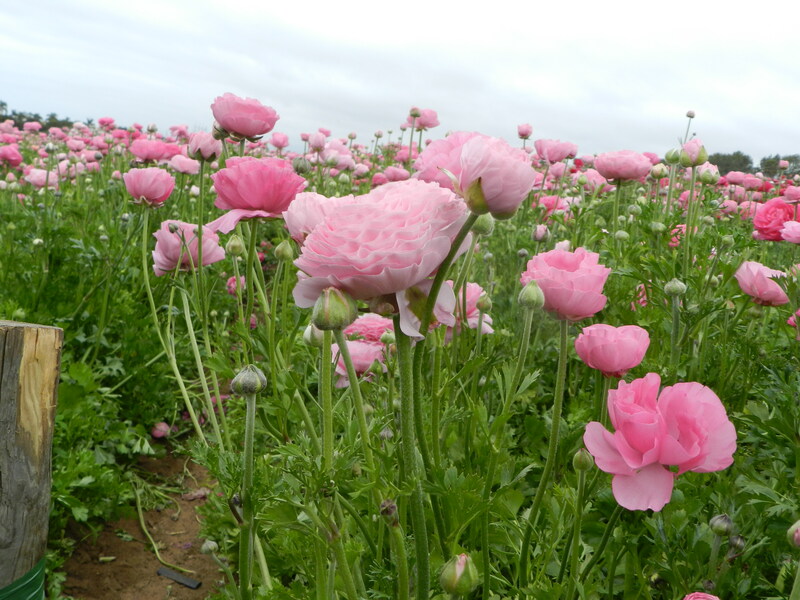 I love love love Poppies. That mandrin colour sets me on fire. Kim, It was truly a glorious week. We did all the things we enjoy doing, and then, on a lark, we did this, too. Flowers really are nature’s beauty. Simply stunning photos – and how endearing that your daughter was so patient in allowing you to capture them. Sometimes I lament that my oldest is still a couple of years from flying the coop but in reading your post, I know I should treasure this time… it’s just so difficult when they’re bring subhuman! Astra, my daughter is so very patient with all my crazies. She complements me well. We’re so different but we have so many common interests. We both enjoyed walking through the flower fields. And yes, treasure your kids while you still have them close. They’ll leave soon enough. Bella, aren’t these flowers amazing?! I cannot even put into words all the emotions ricocheting inside me as my eyes feasted upon this site. 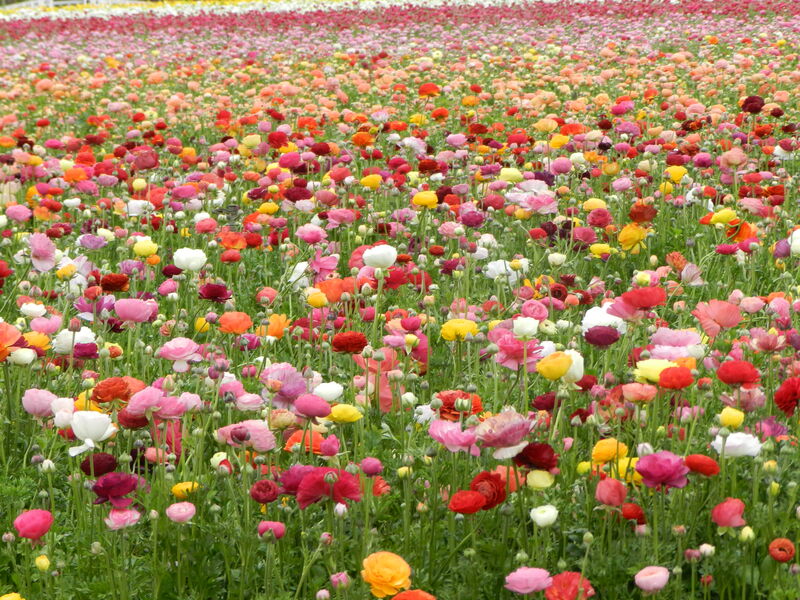 And these photos represent just a small part of the flower fields! We actually got to walk through a maze (and got lost in trying to find the exit) that was filled with Sweet Peas, one of my favorite flowers. Unfortunately, I probably won’t see my chica until late summer, as she’s working on her Study Abroad application. I don’t think it’s in the cards for me to meet up with her while she’s there. Sigh. Wonderful photos Monica! You have a great eye. Those flowers remind me of the Japanese flower garden we use have running along side Baseline Rd when I was very little. They were so beautiful and added a brilliant splash of colors in the desert. They’re gone now. They’ve been gone for many years and it’s sad that they are. All those flowers and colors replaced with buildings. We lost on that decision. Once again a great blog! 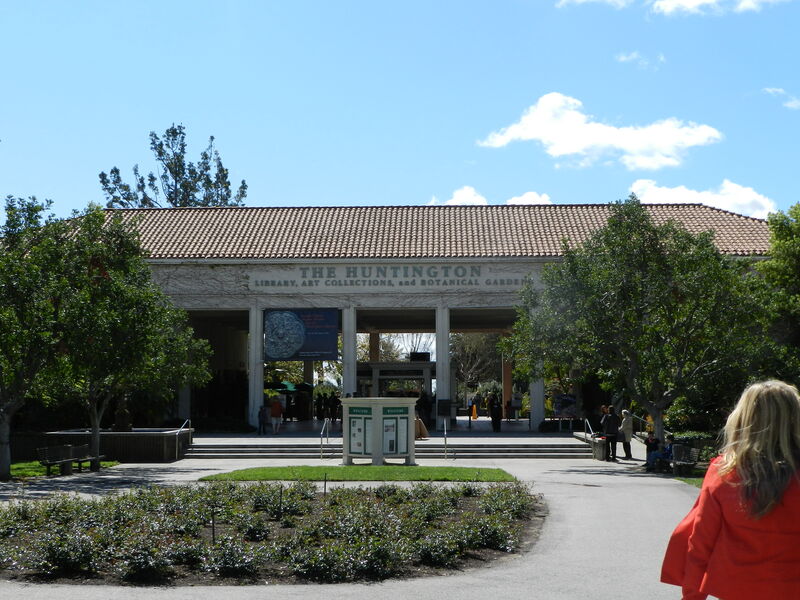 I love the Huntington Library – I lived in Pasadena for a few years ( a few life times ago). I hadn’t thought about the lyrics to that song in a while but you are correct, it does sum up those feelings so well. I was just telling someone today how tough it is being a mom. I sometimes think I wasn’t cut out for this job. On the other hand, I wouldn’t change anything nor do I have any regrets. Still it is tough. Lovely spring photos by the way.. I would love to have that first photo pained on my bedroom wall. I was introduced to the Huntington Library by a very dear friend who invited me there for tea a couple of years ago. Since then, I have been there several times, but each time my daughter has been away at college. So this was her first visit and, Brenda, let me tell you. The botanical gardens there are unbelievable and the tea service is exquisite. My friend and a niece of mine joined us and we had the most delightful day. Beautiful, Monica! I can’t even imagine what it’s like to have a grown child, but through your writing can imagine what my mom felt like when I left the nest. I always thought she was being a little dramatic about our time apart, but now that I’m a mom and I read posts like yours, I realize all moms (or at least most moms) feel this way. Thanks for sharing! Becky, when my kids were little, I thought they’d stay that way forever. Seemed impossible that they’d become adults. Plus, I dreaded the day they would. Well, it happened and you know what? It’s okay. In many ways it’s so much nicer. They can take care of themselves and we can go see R-rated films together and enjoy it. So it really isn’t something to dread but to embrace. It’s fun to see how all those years you invested in raising them, turns out! What a beautiful post Monica, I can’t tell you how precious it is to hold on to time with our children. I just returned from a trip and can’t believe that 2 weeks could fly. With nothing but time and my family with me, I enjoyed every moment, esp seeing the world through my daughters eyes – one likes history and the other loves food. I am not back to reality – if only I could freeze time. I really like those pictures, very pleasing on the eye. We have wall to wall sunshine here and have had since Saturday. I am sitting here beavering away in the office and a cool breeze is blowing through the open window as the sun is off the back of the house . My weekends are spent normally playing trains and it was nice to see families out enjoying the sunshine and doing something together. I know what you mean by a whirlwind week, I could do with a few extra days in mine most weeks. Robert, I’m so glad you like the photos! Last year, I bought myself a new, slightly fancier camera. Nothing like what the pros have, but good enough for me, and it’s been so much fun using it. You can imagine my delight that my pictures turned out okay. I love taking pictures of flowers, they always behave!!! You can find a few of my pictures at http://www.flickr.com/photos/robert_maskill/ with quite a lot of flower pictures in the close ups folder. Sometimes you can get better pictures on a cloudy day than a sunny one. I have a Casio compact camera and carry it most places you never know when you will get a picture!! Have fun with your camera after all that’s what it’s all about. I checked out your photos. They’re beautiful! I love the flowers, but I really enjoyed the trains. You have an amazing “collection” of them. Thank you for sharing! I wish my kids were with me today, but alas yesterday was Day #1 of 14 without them — your post makes me want to squeeze them even harder than I always do! Oh, Mikalee, I know how you’re feeling. I used to hate when my kids had to go, and I wouldn’t see them for a few days. Then, one day, when my daughter was starting middle school, he moved away. My son was already in college but, from then on, my daughter was with me pretty much all the time, which turned out to be very nice. Thank you for your warm comments. Sending you hugs, my dear! Beautiful photos! Wow, Technicolor is right! Such lovely photos! It’s true that life starts to speed away as we get older. Where did our little babies go? 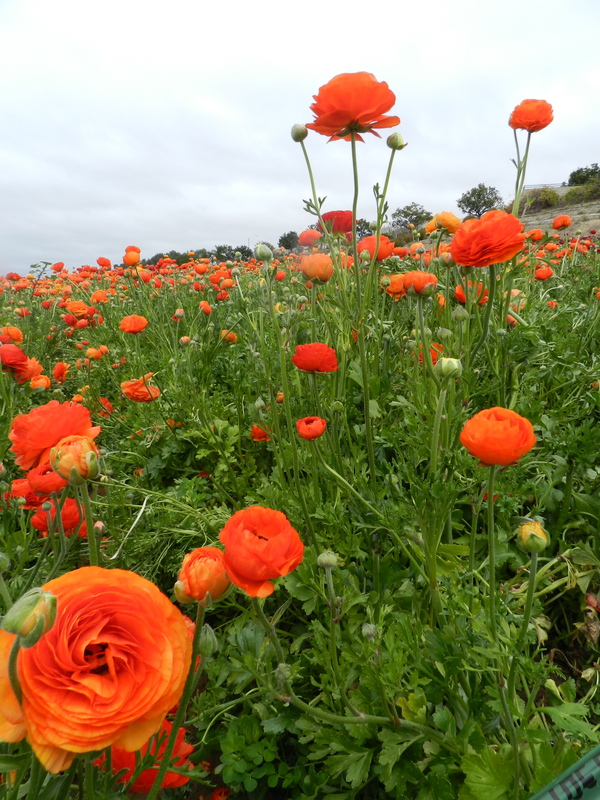 I guess the key is to enjoy it while we can, just like those fleeting ranunculus flowers. Lovely post. Yes, that is the key. To enjoy and appreciate what is there, in front of you, while you can. I’m so glad you enjoyed my post. Thanks for stopping by! 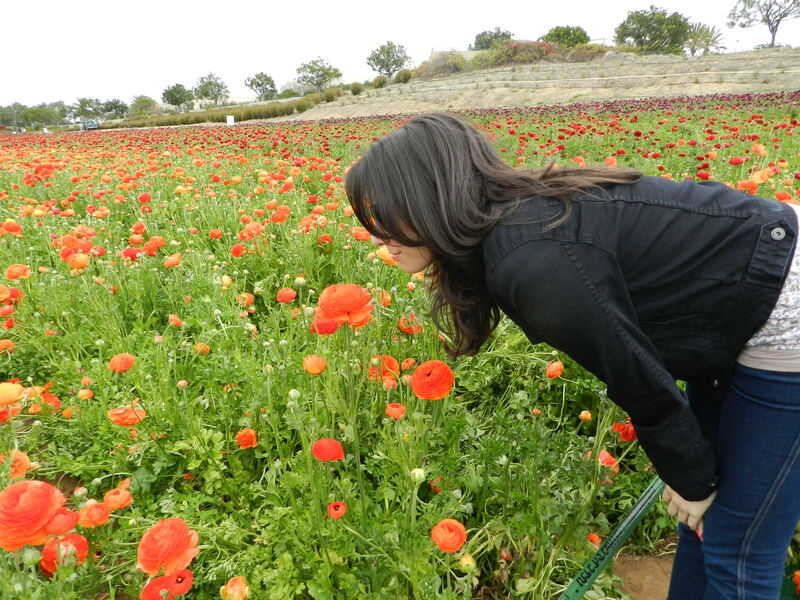 I love the flower fields. Beautiful. How wonderful that you got to share it with your daughter. Stunning photos, Monica, and what a lovely post. Such beauty in your tribute to the time with your daughter, to the beauty of nature, and to the beauty of your words. Thank you, Susan. I wanted to keep this post short so that I could make the photos the focus. Those flowers are truly beautiful!! Great pics! I’m glad you had a nice time with your daughter! If I had a child–even a grown one–I imagine separation would be painful. Love your use of “Sunrise, Sunset.” And the flower photos–stunning!!!!! What beautiful photos and sentiments to match. I’m sentimental about that song as it was sung at my wedding nearly 28 years ago. Time definitely gets away from us. My son is 23 and it doesn’t seem possible. Renee, thank you so much! That song always creates a knot in my throat. I get all emotional hearing it. I first heard it as a teen, and it didn’t quite mean as much. But now, wow. It’s an amazing song. Thanks for sharing Monica. We are into autumn/fall here and it will be many months before we see the colours and the flowers again. Glad you enjoyed your week with your daughter. Thank you, Judith. Always glad to see you stopping by! My week with my girl was simply fabulous! Oh, so THAT’S where flowers come from. I had no idea…. Yep. A little known secret. They come from the ground of sunny California. Don’t know if you know this, but this happens to also be the Poinsettia Capital of the world! Beautiful Photos! You took our sunshine? We are having a storm today! It’s true we made a deal to exchange places, but you didn’t take it all. I would have loved to have a walk with your daughter instead of the week end I described On Sunday! Nikky, it was actually cloudy the day I took these pictures and then the rains came back on Sunday, for a day. But, honestly, I was in HEAVEN strolling among these flowers. I couldn’t get enough of them!